The first corn started showing up at the market this week. 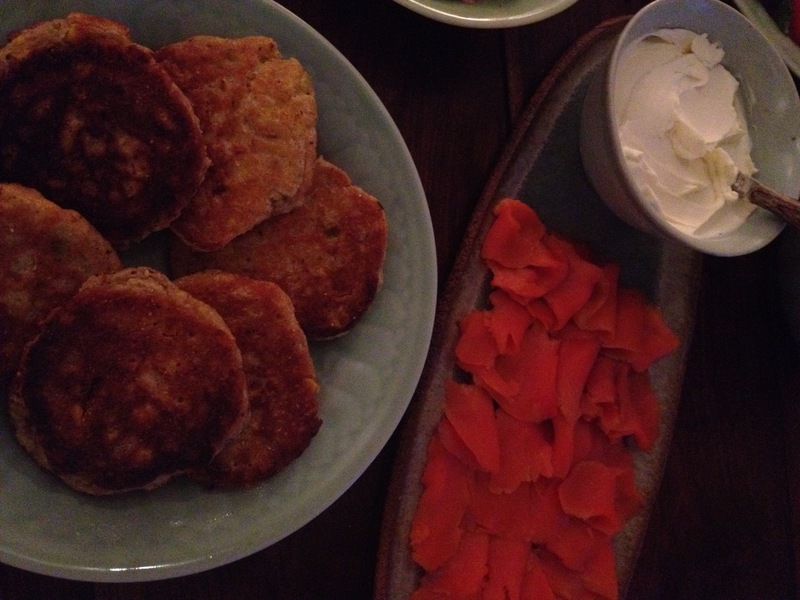 To celebrate I made one of our very favorite things to eat: corn cakes with smoked salmon, salmon roe, and sour cream. I buy wild king salmon roe and wild caught smoked salmon from Russ and Daughters. Usually I like to place a dollop of sour cream on the corn cake first, but lately I’ve become addicted to Russ and Daughter’s house made cream cheese, a sinful hybrid somewhere between butter and whipped cream cream. Use as much or as little corn as you like. When I made these on Friday I used 6 ears of corn that I cook briefly in lightly salted boiling water for about 3 minutes and then let sit until they were cool enough to handle and de-kernel with a knife. One of the ears I had was really small and the rest were medium-sized, it came to about 1 1/2 cups. Use more or less depending on your preference. I like the sweetness and the texture of the corn, so I tend to use more. If you use less, the more cake-like the pancake will wind up. Try varying it and see what you like best. Mix: 3/4 cup organic corn meal, 1 cup flour , 1/3 cup organic cane sugar, 2 teaspoons organic baking powder, 1/3 cup finely chopped scallions or chives, 1 teaspoon salt and a generous grating of black pepper. To the dry ingredients add: 1 – 1 1/2 cups fresh corn, 1 cup whole milk, 1 egg well beaten and 2 T melted, unsalted butter. Mix well. Coat a large skillet with unflavored oil (sunflower etc) and bring to medium high heat, add a tablespoon of the corn mixture. Work quickly as you want these to be nicely brown, but not too dark. You can make several batches and keep them warm in the oven, patting the excess oil off with a towel. It’s best if you can make one batch at a time, garnishing them with a slather of cream cheese, top with a piece of smoked salmon and a dollop of salmon roe, ready to serve (after a sprinkle of some finely chopped chives or scallion on top if you’re feeling very fancy). With some Champagne or a nice bottle of Rosé this is pretty much a meal. Add a salad and a simple dessert (seasonal fruit crumble) and, well, it doesn’t get better than this! After batch one you can slowly continue to make them as you sip champagne. A better strategy than making them all at once, the oven tends to make them soggy, although still great. 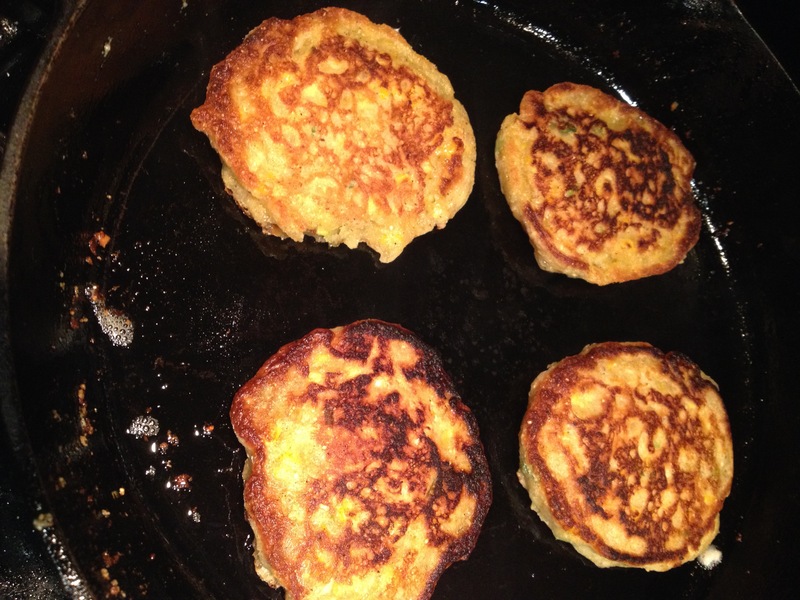 This entry was posted in Recipes and tagged Corn, corn cakes, corn cakes and caviar, corn pancakes. Bookmark the permalink.